Our picks for the best fall Mother of the Bride Dresses for autumn weddings! The fall season for weddings allows for some of the prettiest colors for dresses, and Mother-of-the-Bride dresses are no exception! Gowns and dresses in deep jewel tones of burgundy, ruby red, midnight blue, plum, and emerald along with sparkling neutrals make for wonderful choices for Mother of the Bride dresses for fall weddings. To make your search for the perfect dress for your son or daughter’s autumn wedding easy, here’s a shoppable selection of some of our Mother-of-the-Bride dresses in fall’s best colors from our retail partners. 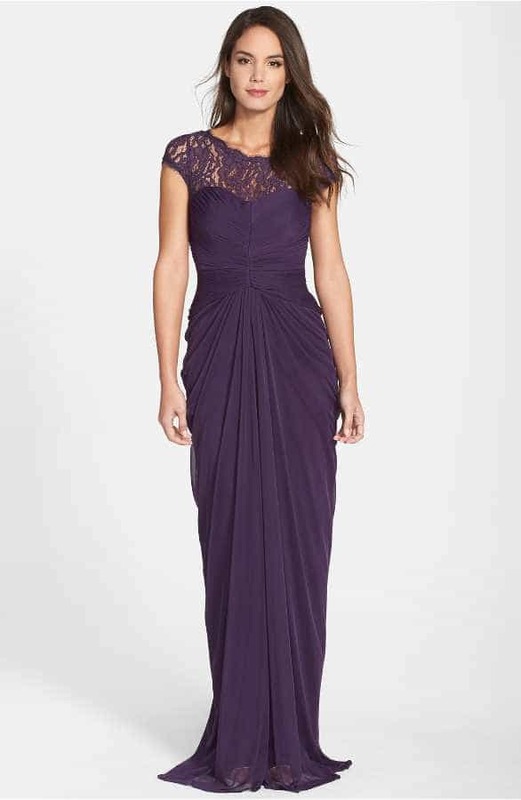 Featured gown, perfect for a Mother-of-the Bride or Groom for a fall wedding: Lace Yoke Drape Gown by Adrianna Papell from Nordstrom.